“Wrong. 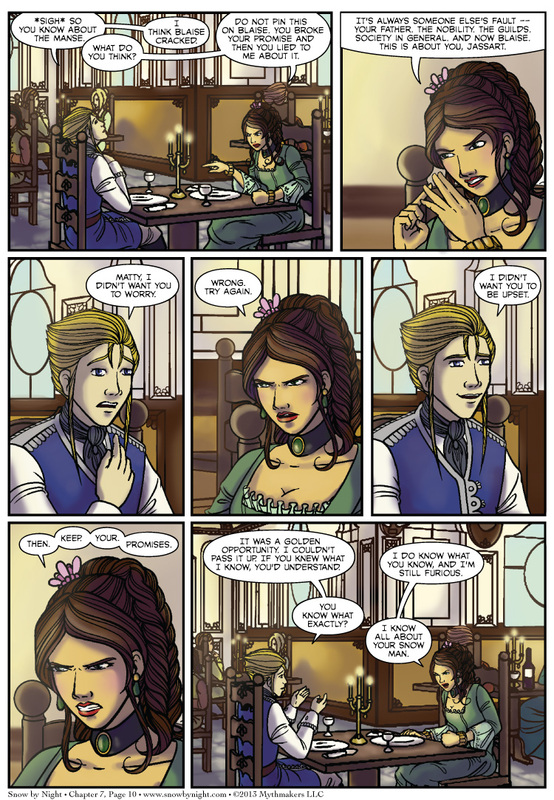 Try again,” says Mathilde on Chapter 7 Page 10. She gets some of the best lines. To see a peak of the next page, please vote for Snow by Night on Top Web Comics. We’re back from Otakon. It’s a great convention but really intense. The artist alley hours are loooooooong. But we’ve got some fantastic pictures for the con report. I’ll upload to our Facebook page those later this week. I do hope that Mathilde is keeping her voice down. It doesn’t look as though she is whispering in the last panel. Having a blazing row in public about the biggest heist in years is not really such a good idea. That’s assuming Alde hasn’t already worked out: ‘Blaise (known thief) has enough money to buy box at opera in company of girl with blue hair, matching description of suspect seen fleeing crime scene’. Or that they haven’t already been grassed up by Laurent.